RUDYARD Kipling was a product of his time. Born in colonial India, steeped in imperialism and empire and dedicated to doing one's duty whatever the cost “for Harry, England and St George”. David Haig's celebrated play examines just one incident in Kipling's life – the death of his son John, my boy Jack. Jon Richardson gives us a quietly infuriating Kipling, always in control, always right and with a clear, defined path before him – he even lays out the route for other people, including his son John. Only once does he explode into anything showing human emotion or even doubt in what is a fine, wholly believable performance. James Kay is the teenage John, 15 when we first encounter him, who is being stifled by his quite yet overbearing, dogmatic father. He is being told to wear pince-nez instead of spectacles to impress the Army Medical Board, despite their refusal to stay on, and he is being coached in his patriotic answers for the interview. His frustration spills out when he is alone with his older sister Elsie, played by Samantha Holden who grows splendidly from girlish charm to womanhood during the course of the play. John is happy to join the army not for King and country, or any higher ideal, but just to get away from the crushing controlled life at their house, Batemans, in East Sussex. John's eyesight is bad enough for him to rival Mr Magoo and he is turned down first by the navy and three times by army medical boards. Most fathers would be delighted that their son was legitimately saved from the slaughter of the trenches – but not Kipling. His dedication to duty, to doing the right thing means he uses his contacts, a dying Lord Roberts, to find his son a place in his regiment – so at just 18, the hopelessly myopic Second Lieutenant John Kipling of the Irish Guards is shipped out to the front and two weeks later at the Battle of Loos he is dead. Kay shows us the schoolboy bullied into unwavering patriotism by Kipling who wants to mould his son into an impossible ideal, the boy turns into the soldier, complete with moustache, then finally back to the boy again in a moving speech to himself about not letting anyone down as he prepares to go over the top to his death. All dressed up to die: James Kay as John "Jack" Kipling ready to fight for king,country and to get out of the house . . . The telegram, which Kipling didn't even bother to read straight away, says John is missing believed wounded which is enough for the gloves to come off as Kipling's American wife Carrie and Elsie accuse him of killing John, with Elsie telling her parents why he had really gone away – to get away from them. 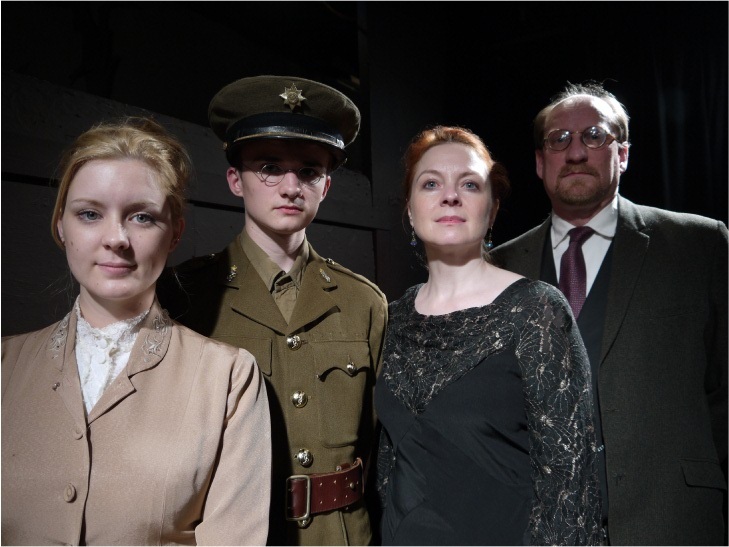 Without a body or confirmation Carrie, beautifully played with a quiet dignity by Zofja Zolna, spends two years with her husband interviewing Irish guards to find out what happened to their son. She is desperate for him to be still alive but that hope dies when Guardsman Bowe, shell shocked , battle fatigued and nerves shot, finally arrives and tells them the awful truth in a moving and poignant scene. It is a truth which for the first time finds a chink in Kipling's stiff upper lip façade of certainty, a realisation that perhaps, maybe, there could just have been a slight possibility that he was wrong, that he might be responsible for his son's death. Almost doubt, for a moment paternalism almost triumphs over patriotism. For a moment he shows grief - but then recovers his unwavering composure. Carrie and Elsie leave him in no doubt who is to blame though and Kipling's earlier claim that if Jack were to be “it would be the finest moment of his young life“ seemed even more empty. Life moves on though, Elsie gets married and as Kipling comes towards the end of his life, he died in 1936, Hitler rises to power in Germany and the whole cycle towards destruction is set in motion again leaving Kipling to question what it was all for, the play ending as he reads his poem – My Boy Jack. 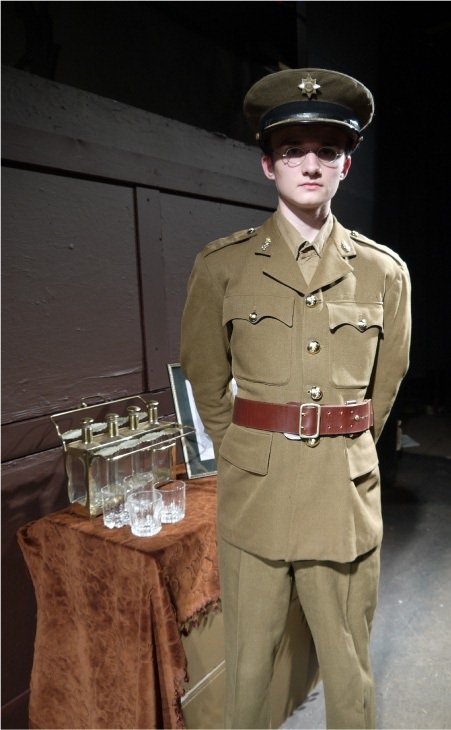 Connor Grant, as Bowe, is in his first stage role outside of school or college, not that you would ever have known it, and he had the added excitement of having to step up to this pivotal part from being Guardsman McHugh just three weeks ago when the original Bowe went sick. He looks as if he could well have an acting future ahead of him. Full marks as well to Sami Moghraby who played a complete one man army from Col Pottle at the Army Medical Board to his added role of McHugh, stepping in nobly to fill the gap in the ranks. There were solid contributions to from Simon Dyke as Major Sparks and Bowe's friend Mr Frankland and Tim Wright as Guardsman Doyle as well as a clever set from Jean Wilde which served as both a drawing room and trenches on the Western Front – a conversion being carried out with military precision by a stage crew in uniform - two, three, four . .
We are kept up to date with what, where and when each scene is set with a back projection system, a useful device also used to good effect in The Glass Menagerie and The Blue Room. Christine Bland's sensitive direction cleverly also used stage crew dressed as maids and servants to change the drawing room scenes – and flowers - as days and years pass but one hopes that the changes do become quicker as the week goes on. This is a gripping, engaging play, beautifully acted but does not have a great deal of action or natural pace so long pauses between scenes with empty stages are not really its friends. That being said it is a well acted, moving piece in the intimate confines of the studio about the effects of war and patriotism on one family with Kipling prepared to sacrifice anything, even his own son, in the name of empire and duty. My Boy Jack lasts two and a half hours but all credit to the cast, it didn't seem anywhere near that long. To 12-11-11.